Your kid has stomachaches and doesn’t like school anymore. That cheerful eight-year-old who used to skip around the house, all colors of the rainbow, is suddenly dragging through his days in shades of gray. When you find out that bullying is the culprit, you might feel helpless. You might feel impotent Mama Bear rage. And as a Solo Mom, you may also experience the lonely certainty that you and your kid are facing this one on your own. You’re not. Bullying may represent its own circle of hell, but others have been there before you. There’s a path through it, and there are books to help. The following titles are a representative sampling of tools that make the journey for a younger child—and you—a little easier. Just Kidding (ages six through nine), by Trudy Ludwig, addresses that subtle moment when teasing turns from affectionate to mean. Illustrated by Adam Gustavson in realistic acrylic paintings, Just Kidding, published in 2006 by Tricycle Press, tells the story of D.J. and his friend Vince. The boys have been buddies for a month, and D.J. thinks Vince has a fun sense of humor—at first. But Vince’s teasing has gotten mean, and when D.J. gets upset, Vince routinely hides behind the “Just kidding!” defense. D.J. ends up “losing it, looking like I’m the jerk because I can’t take a joke.” But with the help of his dad, older brother, and a savvy teacher, D.J. learns how to navigate the situation and seek out friends who make D.J. feel good about himself. The book, which includes tips for kids and their parents, and questions for discussion, underscores the truth that it’s never “just kidding” when a joke is made at someone’s expense. Several books address not only what it means to be bullied but also the power kids have when they’re standing on the sidelines. Published in 2010 by the Early Learning Foundation, The Juice Box Bully: Empowering Kids to Stand Up for Others (for ages four to 12), by Bob Sornson and Maria Dismondy and illustrated by Kim Shaw, explores the idea that bystanders make up the largest population in school—bystanders being kids who see bullying happen but don’t do anything about it—and that kids can be equipped to take positive action when they see bad things happen. In the story, new student Pete has a chip on his shoulder. He’s angry and acts out: in one scene, he steals a soccer ball to disrupt a game. In another, he squirts juice on a classmate’s shirt. But in Mr. Peltzer’s classroom, the kids have made a promise “to take care of ourselves, each other, and our classroom, and to solve problems peacefully. We promised that in this class, no one would stand by and accept bad behavior.” The Juice Box Bully introduces the idea of a pledge both kids and adults can embrace, a promise that includes speaking up instead of fading back as a bystander, modeling good behavior, including others, and talking to a trusted adult if problems get too off the chain. Clearly, the issue strikes a nerve. Peggy Moss’s Say Something (ages five to eight) has sold more than 70,000 copies and was recently released in a special 10th anniversary edition released by Tilbury House Publishers. As the Maine Sunday Telegram noted, the book “sees bullying through the eyes of a sensitive but silent child who learns that her small voice can make a difference.” In Say Something, watercolor illustrations by Lea Lyon depict a young narrator who sympathizes with peers who are bullied but looks away, justifying her inaction by reminding herself that she’s not doing anything mean herself: “I walk on the other side of the hall. I don’t say those things.” But when she finds herself alone in the cafeteria one day, without the buffer of her friends, she becomes the target of jokes that turn mean. 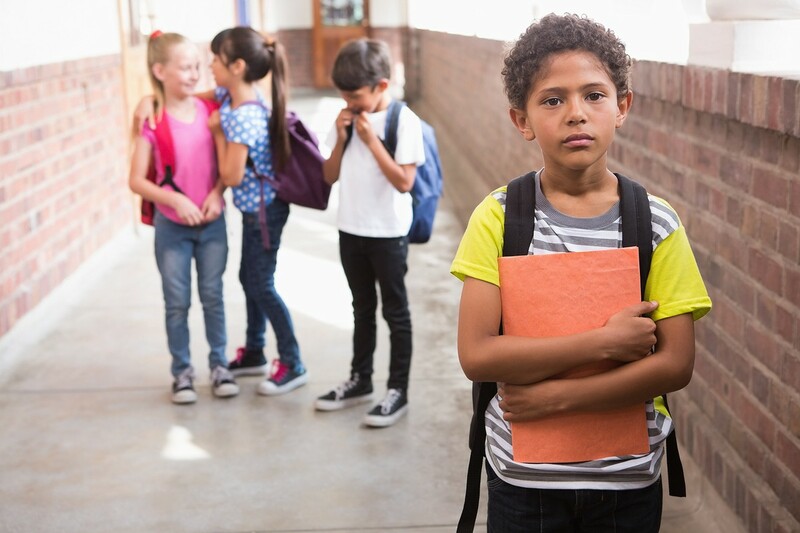 Other kids look on sympathetically but don’t step in to help, and she comes to understand, firsthand, how inaction can be as damaging as the bullying itself. The book’s message? Speak up, reach out. In a quiet but powerful climax, the narrator shows kindness to a girl who always sits alone on the bus, and the girls end up having fun together. The theme of empathy grounds Each Kindness (ages five to eight), written by Jacqueline Woodson and published by Nancy Paulsen Books in 2012, in which Chloe and the other girls turn away from new girl Maya at school. Maya’s repeated attempts at friendship are rebuffed because of her economic status, and she gradually becomes a target of ridicule and rejection. Then Maya moves away, and when Chloe’s teacher talks to the class about the power of even small acts of kindness, Chloe recognizes—and is haunted by—the opportunity she’s lost: “That afternoon, I walked home alone. When I reached the pond, my throat filled with all the things I wished I would have said to Maya. Each kindness I had never shown.” The book, which won a Coretta Scott King Award and the Jane Addams Children’s Book Award, addresses bullying, rejection, and kindness via an empathic storyline and gorgeous watercolor illustrations by E.B. Lewis. Join our private and confidential Safe Space dedicated to bullying to connect with other Solo Moms who understand.